At the heart of any good independent record shop is the fans. Take them away and what is left will not sustain a high street shop. 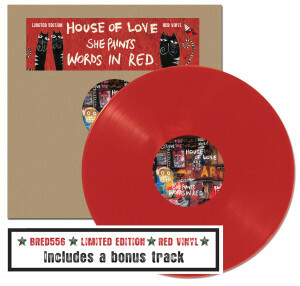 This new House Of Love album of course is only one amongst many each week but it is a good example of the sort of thing that would not only bring people to shops but hopefully would bring other sales too. Of maybe a dozen people I’ve spoken to about this and would buy vinyl if they knew about it less than half actually knew it existed. On a matter of principle customers who asked me if there was vinyl were told it was only available from the label. Again this obsession with selling D2C (direct to customer) means many fans are missed. How are all but the keenest of fans to find out about it ? This is what shops are good at and again I’m sure it would sell well to the many visitors we get many of whom would be unaware there even was a new album. Ironically of all the labels I could think of Cherry Red would be the label that would benefit most from having a large presence in a shop. They have so much good stuff that people just don’t know exists but it can not be for the shop to showcase the label and take all the risk. If I owned Cherry Red I’d be consigning as much stock as I could to shops as they would be doing their part just dedicating the space to the label. And if I owned HMV I’d be filling those vast spaces with the entire Cherry Red catalogue. Shops aren’t asking for favours they will simply do a far better job at letting the wider public know that releases are available. Clearly the desperation to keep HMV going recognises that but then both sides make a complete arse of how they go about it. My eldest daughter is called Christine for several reasons. One of them is the House Of Love. My eldest is called Gloria. Guess why. Soon going to Scotland after 22 long years. Still two Avalanche Records in Edinburgh? I remember I got The Bathers’ Sweet Deceit there among others. A true landmark in Scottish music as far as I’m concerned. Still Margarita and other Jesse Garon & the Desperadoes working there? And by the way, also a huge The House of Love fan. We have one shop in the Grassmarket now. Andrew is a primary school teacher and Margarita works for an Italian company in the arts and also spends time in India. Say hello when you are in. I’m going to Glasgow but I’ll try to make it to Edinburgh and of course to Avalanche Records. All the best.